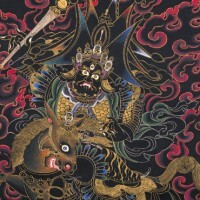 The Protector Setrap appears to us as a wrathful emanation of the Buddha Amitabha, where he protects us as angry, though concerned, parents would towards their wayward children ~ hoping to wake them to their senses and bring them onto the correct path. Though in a wrathful form, the Protector is always motivated by compassion and loving care for all sentient beings. As an Enlightened Buddha, Setrap’s apparent fury is never directed against any beings. Instead, his wrath is directed at destroying our inner and secret defilements of attachment, anger, ignorance and our self-cherishing attitudes which bring us so much suffering. Utterly opposed to attachment, Setrap acts with objectless equanimity towards all beings. Being the great enemy of anger, Setrap acts with supreme love towards all beings. Being the victor over ignorance, Setrap directly cognises Emptiness and possesses the highest wisdom that perceives the best manner of liberating all sentient beings. As the antidote to the self-cherishing attitude, Setrap cherishes all beings above Himself. With sincere prayers and request of His assistance, Setrap is known to accomplish the swiftest destruction of outer, inner and secret obstacles in our path towards Enlightenment.